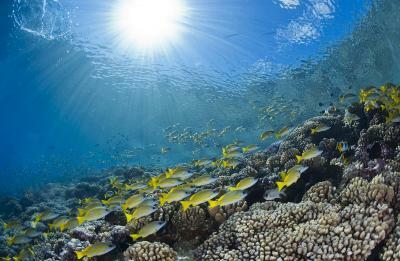 Many coastal areas who have or once had pristine coral reefs, rely on ecotourism for part of their income. But, once the reefs start to die out, the fish move away and the once sought-after snorkeling spot becomes a skeletal reef for the history books. Coral reefs aren’t only beneficial economically, they also act as important carbon sinks, and homes and food for marine life. Their value cannot be measured with a price tag since they are a crucial part of the Earth’s ecosystem. A study published today in Nature Climate Change by University of Miami Rosenstiel School of Marine & Atmospheric Science scientists shows how different levels of carbon emissions can cause coral bleaching. The study used recent data from the Fifth Assessment Report of the Intergovernmental Panel on Climate Change (IPCC) to create climate models. Although some types of coral bleaching can be a localized seasonal event, coral bleaching in mass quantities is caused by water temperatures that are too warm. This is because the algae, or zooxanthellae, that live inside the coral skeleton and give it its color cannot tolerate the temperatures and become expelled from the coral. If too many zooxanthellae become expelled, the corals become malnourished and die. The climate models showed that if current carbon emissions stay on the path they are currently on, then 74 percent of the worlds coral reefs may experience detrimental bleaching events. Ruben van Hooidonk, Ph.D., from the Cooperative Institute for Marine and Atmospheric Studies (CIMAS) at the University of Miami and NOAA’s Atlantic Oceanographic and Meteorological Laboratory said that some reefs need more urgent attention. Jeffrey Maynard, Ph.D., from the Centre de Recherches Insulaires et Observatoire de l’Environnement (CRIOBE) in Moorea, French Polynesia, says that there is still a little time to try to lower emissions, but it is running out. As history has shown, reducing carbon emissions takes a worldwide effort, which can of course be problematic. This study can perhaps serve as yet another wake up call to planet earth and the humans on it that climate change is real and action needs to be taken. . . fast. The study was funded by the Pacific Islands Climate Change Cooperative based in Hawaii, the U.S. National Research Council and CNRS.